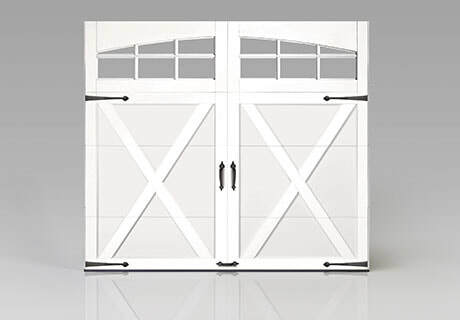 COACHMAN® collection garage doors feature the charming appearance of an old-fashioned swing-out carriage house door but offer the built-in convenience of a modern overhead garage door. Throughout the design and construction, there is a recurring blend of beauty and practicality that is evident in the details, like the attractive yet durable steel and composite construction. Four factory finish paint and overlay colors. Overlay and base colors can be mixed to achieve desired look. Cedar Rapids, Iowa City, ​North Liberty, Des Moines, the Quad Cities and beyond.